Rewards Canada: American Express Business Gold Rewards Card back to First Year Free and sign up bonus increased to 30,000 points! 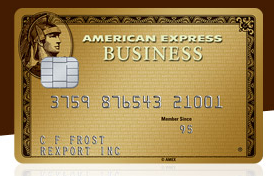 American Express Business Gold Rewards Card back to First Year Free and sign up bonus increased to 30,000 points! Although it is a Business card many individuals have had success applying for and receiving the card simply by making themselves the ‘business entity’ making this a key card for the 'travel hackers' out there looking to maximize rewards from credit card applications. The only thing you have to be aware of is the spend requirement to get the sign up bonus which is $5,000 in three months so some people may find this hard to achieve. Whether you choose to use the 30,000 points via TripFlex for a $300 travel credit or convert to Aeroplan or Avios, this update to the card is a great enhancement! • Earn a Welcome Bonus of 30,000 points when you charge $5,000 in purchases to your Card in your first three months of Cardmembership. That’s enough to redeem for a $300 TripFlex™ rewards statement credit to use towards eligible travel purchases charged to your Card. • Enjoy the freedom of being able to transfer your points, at no charge, to many frequent flyer and other loyalty programs including 1:1 to Aeroplan®* and Avios. • Go online to access the paperless Expense Management Reports delivered quarterly and annually, for flexible tracking and simple tax preparation •Maximize your cash flow with up to 55 interest free days, so that money can come in before it goes out.